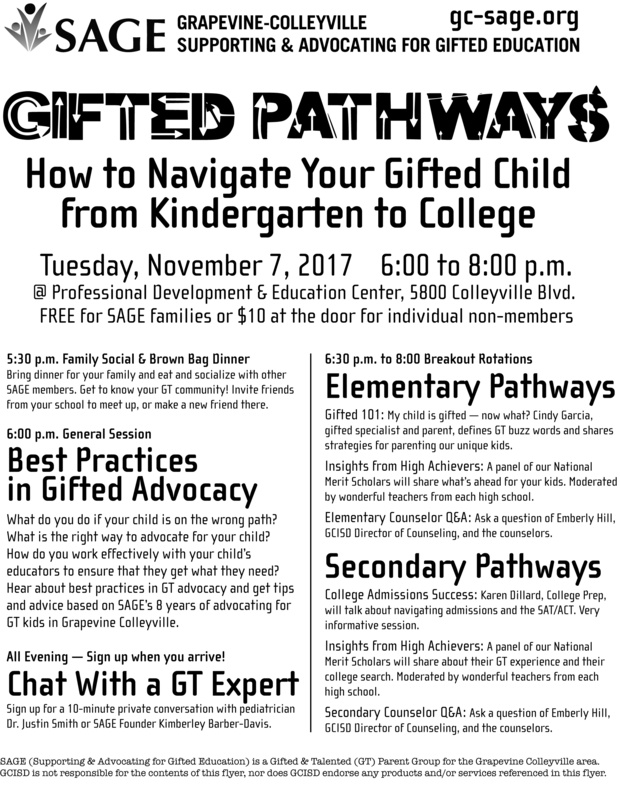 Gifted Pathways: Navigating Your GT Child from Kindergarten to College will include breakout sessions for parents of gifted children of all ages. Sessions will focus on the unique needs of GT kids at each stage of life. The event will be on November 7, 2017, from 6 to 8 p.m. at the Professional Development and Education Center (PDEC), at 5800 Colleyville Blvd. The event will be free for SAGE members’ families. Admission will be charged for non-members. Join SAGE today. Follow our event page on Facebook. Stay tuned for all the details — and save the date! Bring dinner for your family and eat and socialize with other SAGE members. Get to know your GT community! Invite friends from your school to meet up, or make a new friend there. What do you do if your child is on the wrong path? What is the right way to advocate for your child? How do you work effectively with your child’s educators to ensure that they get what they need? Hear about best practices in GT advocacy and get tips and advice based on SAGE’s 8 years of advocating for GT kids in Grapevine Colleyville. All Evening — Sign up when you arrive! Sign up for a 10-minute private conversation with pediatrician Dr. Justin Smith or SAGE Founder Kimberley Barber-Davis. – Gifted 101: My child is gifted — now what? Cindy Garcia, gifted specialist and parent, defines GT buzz words and shares strategies for parenting our unique kids. – Insights from High Achievers: A panel of our National Merit Scholars will share what’s ahead for your kids. Moderated by wonderful teachers from each high school. – Elementary Counselor Q&A: Ask a question of Emberly Hill, GCISD Director of Counseling, and the counselors. – College Admissions Success: KD College Prep will present about navigating admissions and the SAT/ACT. Very informative session. – Insights from High Achievers: A panel of our National Merit Scholars will share about their GT experience and their college search. Moderated by wonderful teachers from each high school. – Secondary Counselor Q&A: Ask a question of Emberly Hill, GCISD Director of Counseling, and the counselors.